On December 16, 1953, the United States Air Force contracted (Contract No. NOAS 54-427) with the Lockheed Aircraft Corporation for 33 C-121C Super Constellations, military cargo/personnel aircraft, to be delivered between June 1955 and May 1956. All 33 aircraft were eventually delivered to the 1608 Air Transport Wing of the Military Air Transport Service, 41st and 76th Air Transport Squadrons, Charleston, South Carolina. Aircraft 54-0156 was delivered to the 1608 ATW on November 1st, 1955. From that date until 1962, the aircraft flew on many missions for the Air Force, ranging from the United States to the Caribbean, the United Kingdom, Europe, the Mediterranean and the Middle East. In the fall of 1962, the 41st and 76th ATS transitioned from Constellation to the Lockheed C-130E Hercules. On October 16th, 1962, 54-0156 was reassigned to the 118th Military Airlift Wing, 172nd Military Airlift Group, 183rd Military Airlift Squadron of the Mississippi Air National Guard at Jackson, Mississippi. This group operated a total of 8 C-121C's on various support duties within the continental United States and over the North Atlantic. In the spring of 1967, the Constellations were transferred and replaced by C-124C Globemasters. On March 1st, 1967, 54-0156, along with other Constellations, were assigned to the 171st MAW, 167th MAG, 167th MAS of the West Virginia Air National Guard, Martinsburg, West Virginia.54-0156 was mainly used by the 167 TAG for Aero-Medical transport and cargo missions.They were eagerly accepted as replacements for the C-119s that they had been using and were called "A class ride" in comparison. 54-0156, along with other C-121's continued serving in the Air National Guard for 5 years until they were retired and replaced with C-130/A's. In March 1972, 54-0156 was retired to the Military Aircraft Storage Depot at Davis-Monthan Air Force Base, Tucson, Arizona for storage and ultimately, disposal. On June 6th, 1972, 54-0156 was transferred to the National Air and Space Museum of the Smithsonian Institute as a bargaining tool for the museum to acquire a Boeing B-307 Stratoliner from an aerial spraying firm called Aviation Specialties. The deal was finalized on August 17th, 1972 and 54-0156 was sent to Mesa, Arizona, where it commenced it's new life as an aerial spray tanker, entering the civilian ranks as N73544 on March 26th, 1973. N73544 was primarily used in spraying for budworm infestations around the forests of Maine and Quebec, Canada from 1973 to 1976. Returning to Mesa, Arizona in 1976, and later to Chandler, Arizona, N73544 languished in the hot Arizona desert until December of 1982, when it was purchased by the current owner, Mr. D. Benny Younesi, and was flown to Chino, California. In January of 1984, N73544 arrived in Camarillo, California from Chino with a feathered #4 propeller. With no operating base to work out of and no one available to repair or maintain the aircraft, N73544 sat forlornly on the east end of the Camarillo Airport with little or no hope of ever flying again. It soon became known as the "Condemned Connie", and sadly, was becoming an eyesore for the airport. 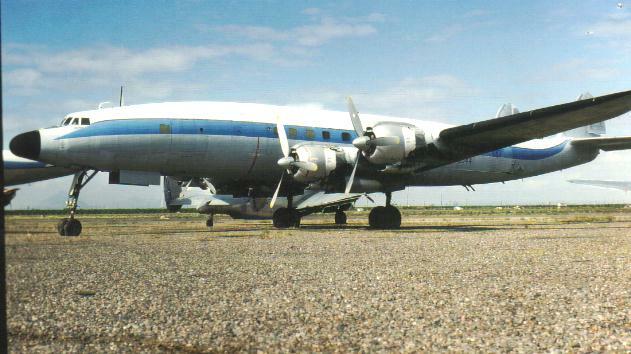 In 1989, a group of dedicated enthusiasts, calling themselves the Constellation Historical Society, banded together to begin the slow process of restoring N73544 back to it's former glory and beauty. On June 23rd 1994, that goal became a reality when, for the first time since 1984. N73544 returned to the skies once again! 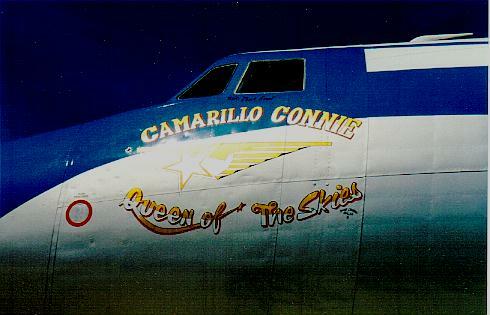 No longer called the "Condemned Connie", this beautiful example of a by-gone era has returned to be shared with future generations at air shows around the country. Ultimately, when N73544 has been completely restored, it will be one of five remaining Constellations left flying in the world out of a total of 856 built. So, please, return with us to the glory days of pistons and propellers, and enjoy the last flyable, authentic military C-121C Super Constellation left in the world.